Grumpicon – The tool processes a set of SVG files, generates PNG fallback images for legacy browsers, and exports a demo page showing how to use the final icons. svgo – SVG Optimizer is a Nodejs-based tool for optimizing SVG vector graphics files. jsonschema2pojo – Generate Plain Old Java Objects from JSON or JSON-Schema. http://tools.android.com/tips/layout-designtime-attributes: Android Design Time Layout, display values in the designer, but not included in the build. http://square.github.io/picasso/ – Picasso allows for hassle-free image loading in your application. My laptop is just running worse and worse and its apparent that it’s got a lot to do with the lack of free disk space.Â I’ve been trying to prune down the data requirements, but that just never works. 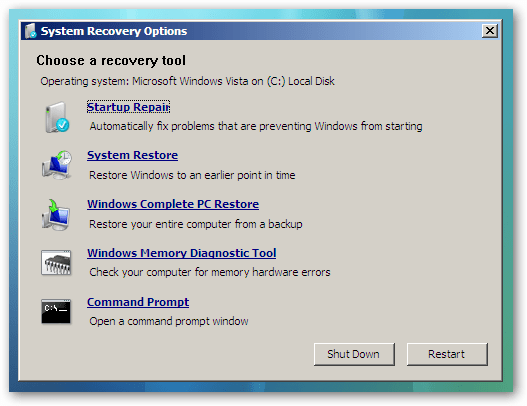 If found this article,Â The Page Starts Here: How to move windows 7 to a new or larger hard drive using Backup and Restore, that describes how to migrate a system to a bigger driver.Â It seems pretty straightforward.Â Â Make an image backup of the system, replace the drive, restore. 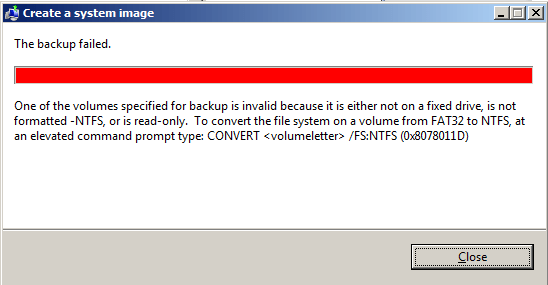 Step One and already lots of problems.Â I decided to use Windows 7 Backup and Restore since that’s what the walk-through used, but I immediately get the error “The backup failed.Â One of the volumes specified for backup is invalid because it is either not on a fixed drive, is not formatted – NTFS, or is read-only. (0x8078011D)”.Â Of course, I am using a fixed drive, formatted with NTFS, and is Not Read-Only.Â In fact a regular data backup works, at least for a while until it eventually fails on a data error. I did find one post that claimed that the problem was that the OEM partition is not an NTFS partition or mapped and this is what causes the problem.Â They suggest converting the drive to NTFS and giving it a drive letter.Â It seems a bit drastic to me. I even had trouble generating the Recovery Disk, since it claimed that it couldn’t find a writable CD/DVD drive.Â So more strange stuff, but re-booting cleared that up. Failed to read data from the disk. Failed to read from sector '274,384,408' of hard disk '1'. Operation with partition '0-0' was terminated. I found the solution to this on one of the Acronis support groups.Â It is to do a “chkdsk /f /r” which fixes the errors on the disk, locates bad sectors and recovers readable information.Â This took a very long time (about five hours), but was able to fix the bad clusters on the hard drive. Read failure with status 0xc0000185 at offset 0x20842bc000 for 0x10000 bytes. Read failure with status 0xc0000185 at offset 0x20842c3000 for 0x1000 bytes. Â  1449004 free clusters processed. Now when I re-run the Acronis the backup works successfully, created the Rescue Disk and I’m ready to go. The new drive is a 640GB drive. It’s just a matter of taking out the old one and putting the new one in.Â The Dellâ„¢ Latitudeâ„¢ E6510 Service Manual – Hard Drive section describes this.Â Just unscrew the hard drive, pull it out, swap the face plate, and replace. Finally I needed to increase the partition size.Â When the system was restored, the READER partition was immediately after the OS Partition so I deleted the READER partition, increased the OS partition in the Disk Management application, and then re-restored READER. Which I tried, but didn’t work. However, if I just trusted in Microsoft to fix it for me with the Startup Repair Tool as described in How-To Geek’s Fixing “BOOTMGR is missing” Error While Trying to Boot Windows 7 or Vista. Crossed my fingers as it rebooted and it all magically started working. The results of going through this process were definitely well worth it.Â The laptop is no longer running sluggishly, it’s runningÂ now like it was when I first got it. Today I rebooted the laptop and it said it needed to do a chkdsk.Â I don’t know why but it found a bunch of “Deleting corrupt attribute record (128, “”) from file record segment NNNNNN and Recovering ophaned files.